The Guizhou Wine Festival is BIG. Mr. Domenico Musco is an Italian Industrialist whose company, SPARK ELETTRONICA Srl (SPARK) http://sparkelettronica.wix.com/sparkelettronica is interested in developing cooperation with Guizhou companies. SPARK has advanced expertise in electrical wiring systems, wire testers, automated sensors and control systems, and automated food sector production. The food sector services provided by SPARK include extensive automated solutions to the beer and wine industry. Mr. Musco is particularly interested in Guizhou Province because of Guizhou’s prominence in these beverage industries. The automated systems provided by SPARK can greatly improve testing and feedback control systems, reducing human error and increasing production speed. Mr. Musco and staff have over fifty years in the field of automation and sensors in a variety of industries. His wiring and control solutions have ranged from giga-ohm to nano-ohm systems. Mr. Musco can be reached via email at dommusco@tin.it . The Octoberfest celebration is finished and it was a good time. The Paulaner brew pub on the sixth floor of the Kempinski brewed an Octoberfest beer that was very good. It was very German, but not too heavy and not too dark. The happy hour (two for one) prevailed all night, rather than cutting off at 8 pm. The Manager, Aynur Ozcan, has put together a friendly and competent staff. A fine time was had by all. 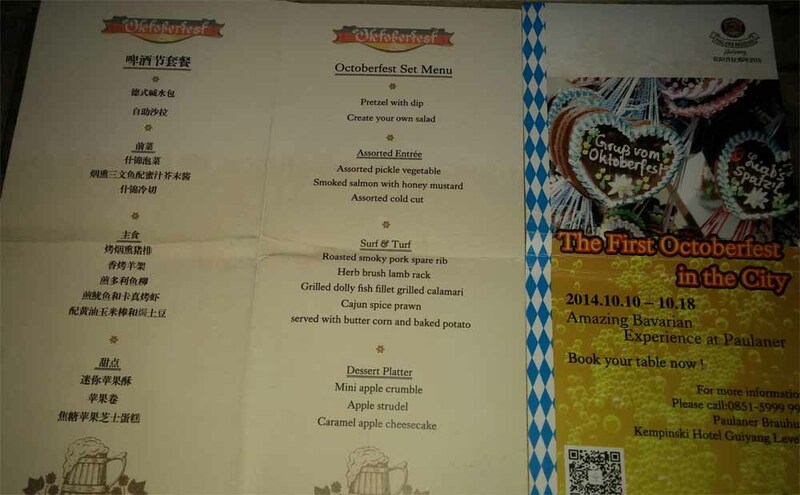 The menu is very cool, with many items for 58 RMB, which includes a salad bar. There were two bands, who alternated to keep the evening lively. . . There were many good times and good songs. Finding Waldo, The USA exhibits were hard to find, but were there. The USA exhibits at the China-Guizhou International Alcoholic Beverages Exposition were hard to find, but the wine tasted good. Alco-Tourism. These are some of my favorite shots from the wine festival. They capture the flavor of the event. Buses 48 and 58 come here. I visited the Wine Festival from the 9th to the 12th. Most of the action takes place on September 10 and 11, with a lot of public there and wineries in full competition. The 9th saw the festival open only to exhibitors, with opening to public toward the end of the day. Many countries were represented. The Guizhou government subsidized travel expenses, paid for shipping of wine, and provided free kiosks to the exhibitors. In a “Where’s Waldo” moment, I had trouble finding the USA exhibitions. They were kind of tucked away, and not well presented. Not many USA wineries were represented, by comparison to France, Italy, Eastern Europe, and South America. Another Where’s Waldo moment was when my Argentine friend looked for his home country. Although Argentina wine is all over Guiyang, Argentina wasn’t represented at the Expo. Maybe that was a mistake . . .
A World Alcoholic Drinks the Alliance (WADA) was formed to share resources and promote group competitiveness. Wine industry associations have organized and formed this association, with the first meeting held at The China-Guizhou International Alcoholic Beverages Expo. The first session of this new organization was held on the morning of September 9. Alcoholic drinks associations were represented from five continents.